Q1. In an IP routed backbone, why is it necessary for P routers to hold full external routing information? Q2. How does the full routing requirement change with the introduction of MPLS into the core? Q3. What are the two advantages to carrying external routing in BGP rather than in the service provider IGP? Q4. When running OSPF, why is it necessary for the PE loopback addresses to be a /32 host address? Q5. Why can’t PE loopback addresses be summarized within the backbone? Q6. During the PE import process, what can be used to filter out certain routes? Q7. 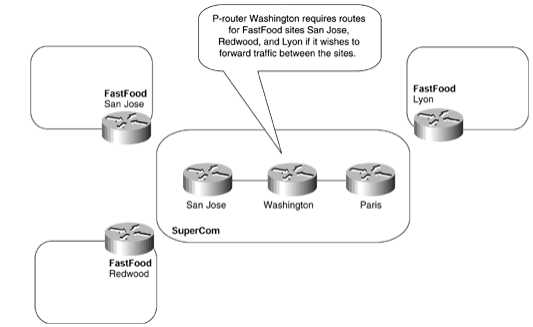 Is it possible to advertise routes from the same VRF with different RT values?